Last week, Jon went on vacation with the boys and left me alone to fend for myself. Last time he went out of town, I made a big batch of chili and it lasted me the entire week. I do like to cook, but I don’t like to do it everyday. 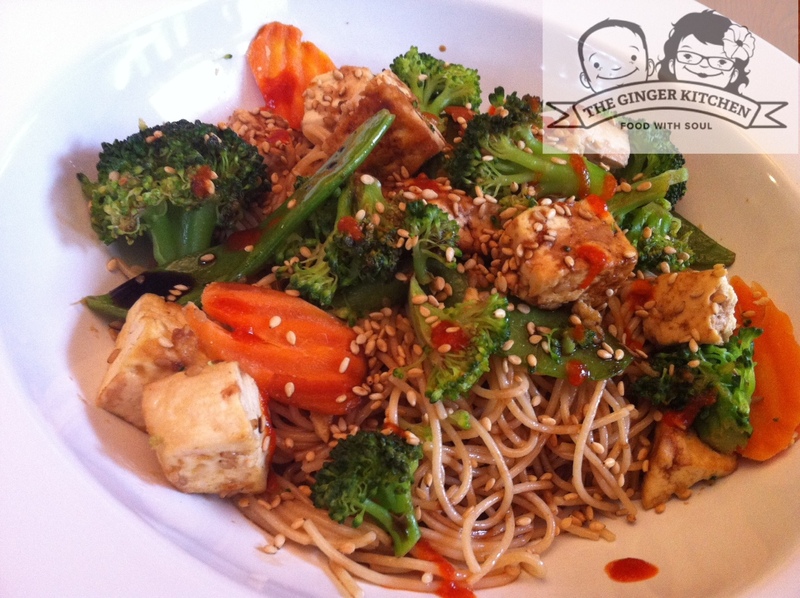 So, this week, I prepared a huge batch of Sesame-Ginger Tofu and Veggie Stir Fry. Quick, easy and super tasty! Prepare Angel Hair pasta according to package instructions. We always add a splash of olive oil to the water as it boils. Drain pasta and toss with 3 tablespoons sesame oil and lemon juice. Heat 1 tablespoon of sesame oil in a large pan. Place tofu in pan and sprinkle with ginger. Cook tofu until browned on all sides. Add veggies and fish sauce, cover and cook until veggies are soft. Toss tofu-veggie mix with pasta. Add soy sauce and Sriracha to taste. Top with sesame seeds. *Normally I’d use organic Soba Noodles, but I couldn’t find them in the grocery store this trip so I substituted angel hair pasta. Yay, glad to see you think an Asian stir fry is quick and easy. This looks very enticing. I noticed you use sesame oil for frying. It doesn’t handle high heat well and is quite overpowering in the ‘flavor’ dept. I love your beautiful, clean blog. And thanks for follow. Thank you for your kind words. I love sesame oil so I tend to overuse it. What do you recommend for stir fry?